Director David Zucker (the Naked Gun movies, BASEketball, and co-director of Airplane!) gets to work with a lot of younger talent and up-and-comers in this comedy. 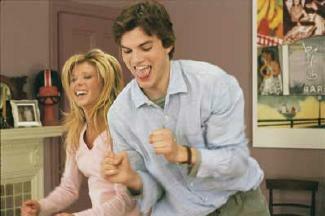 Among the cast are Ashton Kutcher (TV's That '70s Show), Tara Reid, Andy Richter, and Molly Shannon. The movie is about a young man (Kutcher) who is asked to housesit for his boss. He's had a crush on the boss's daughter (Reid) for a long time and uses this opportunity as a chance to get close to her and win her heart. But he doesn't plan on the long line of other houseguests that try to keep him from his mission. He also has to deal with the daughter's older brother (Richter), who is on the run from local drug dealers. The plot details remain the same, although we now know that Terence Stamp (from The Limey) plays Ashton's egomanic boss/Tara Reid's father. And somehow were guessing that Michael Madsen will be the one playing the "gun-toting, maniacal drug-dealer" who is after Andy Richter. Just a hunch.